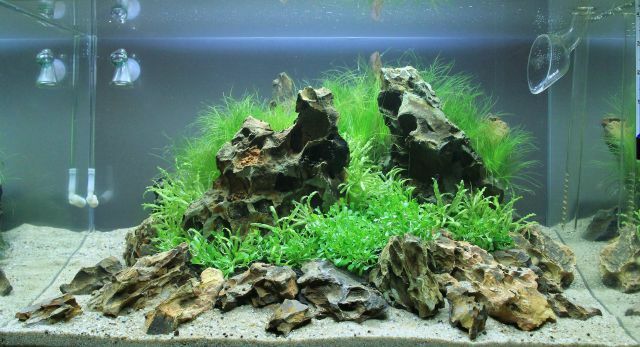 Iwagumi style layouts are a special form in aquascaping - the design of aquarium landscapes. Takashi Amano, the originator of nature aquaristics, invented the Iwagumi concept. In doing so, natural rock formations or landscapes are recreated. Based on the principle of Japanese stone gardens, Amano managed to create a particularly natural flow and dynamics through carefully positioned stones in the aquarium tank. Through his experiences as a wildlife photographer and his observation skills for percieving water flow in nature, he was able to portray these unique and breathtaking scenarios in an aquascape. Iwagumis are characterized by their puristic design. A fundametal criterion is using only one particular type of stone as decorational element. Driftwood or roots are not used in an Iwagumi. While certainly aquatic plants are indeed used in such a layout, the focus is on the stones. They provide a special power and radiance to the layout. 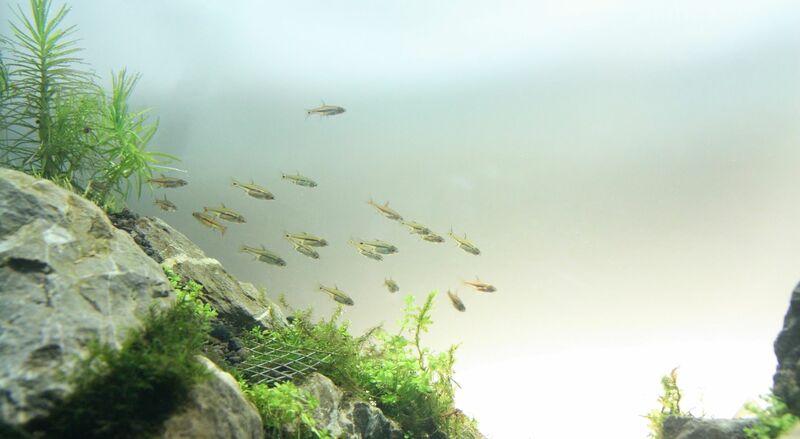 The basic design of Iwagumi "Tanshoku Tanei" translates to "one type of plant, one type of fish”. This means that the aquarium designer, in addition to the exclusive use of stones, further limits himself into using only one species of water plants and one species of fish. 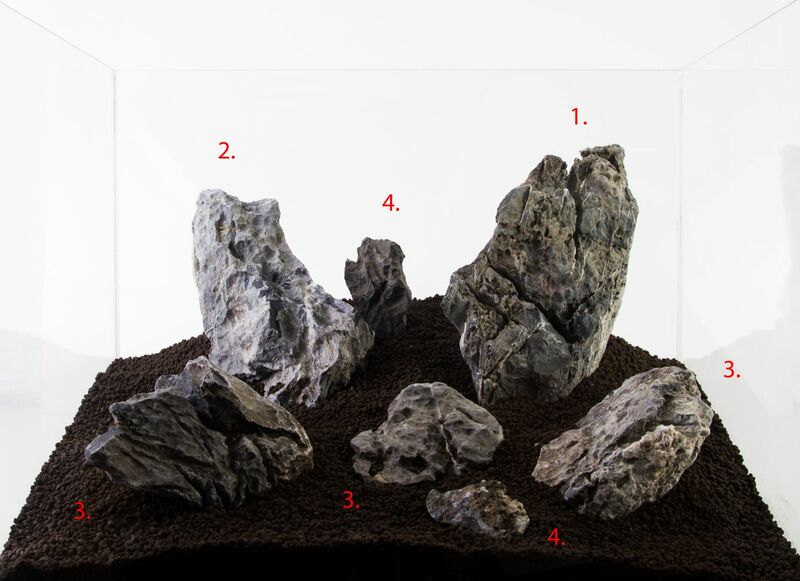 This puristic approach awards an aquascape with even more expressiveness. Of course, there are also other interpretations of the Iwagumi style, in which different types of plants and fish are used, but those appear less puristic and more colour- and playful. It is said to be quite a task to design an aquarium in the Iwagumi style, because a lot of value is put into the correct positioning of the stones. To make an Iwagumi appear as natural as possible, differently-sizes stones are used. An even number of decorative stones is avoided. A mainstone (1), also Oyaishi, is the main attraction in the layout. This is the largest and most striking stone. The Fukuishi (2) is the next smaller stone, which forms a visual counterpoint to the main stone, so to speak. This means that its orientation interrupts the line of the main stone and thus provides a visual counterweight. This creates a certain drama. Smaller Soeishi stones (3) support the impression of the main stone. The suteishi (4) are the smallest stone elements in an Iwagumi and form the final details in such a design. 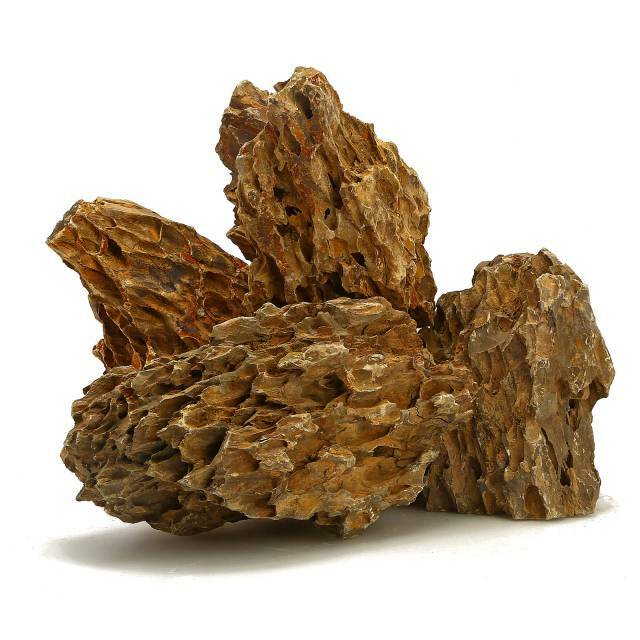 In an Iwagumi expressive stones are used, that are very furrowed or have a pronounced texture. Popular sorts are e.G. dragon stones or Seiryu. Since the stones are the only prominent decorative elements, special care should be taken on keeping a harmonic flow in the positioning and texture of the stones. The texture of the stones already dictate certain lines. These should be considered and combined into a harmonious overall concept. An Iwagumi usually only contains very few species. Since the overall impression of the layout is supposed to be reminiscent of a rocky landscape, ground cover or grassy types are used. An Iwagumi with many carpeting plants. In order to mitigate the impression of very massive stones, classic Iwagumis use higher-growing grassy plants in the background, like Eleocharis vivipara or Vallisneria nana. Of course, stem plants can also be used in an Iwagumi. Such layouts give a softer and warmer overall impression than puristic Iwagumis in the most classical sense, especially when redder plants are used. The article "stem plants in the Iwagumi" by ADA covers this topic in even more detail. A freshly set-up Iwagumi with stem plants. If you stay true to the creed "Tanshoku Tanei", you shouldn’t choose a plethora of wildly mixed fish for your Iwagumi. Of course the fish need to be chosen in accordance to the water values. Very effective and puristic would be a portly school of not-too-hectic fish, majestically swimming its circles in the tank. This supports the tranquility of the Iwagumi. Small fish support the whole landscape-approach of the layout even more. With some luck and skill, the swarm will position itself in such a way for the Final Shot, that it’ll appear like a flock of birds in a landscape.